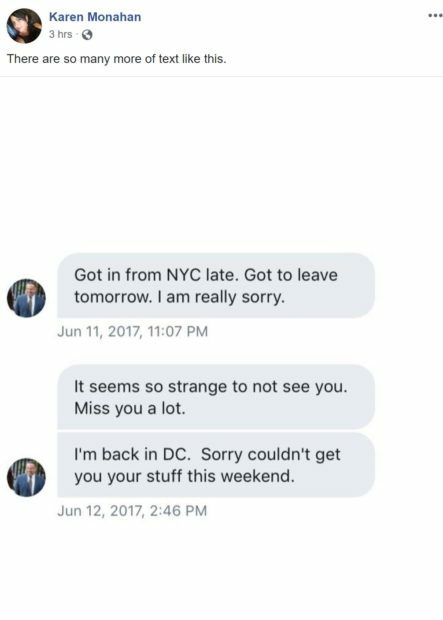 Karen Monahan, the former girlfriend of Democratic Rep. Keith Ellison who has accused him of domestic abuse, on Saturday posted on Facebook several screenshots of messages she allegedly received from the congressman in 2017. Screenshots of messages Monahan posted on her Facebook page. “Sufferers of what’s called narcissistic personality disorder aren’t just vain; they’re grandiose about themselves to the point of obsession, charmingly manipulative, and often have a sociopathic lack of empathy towards others,” read a message from March 1. 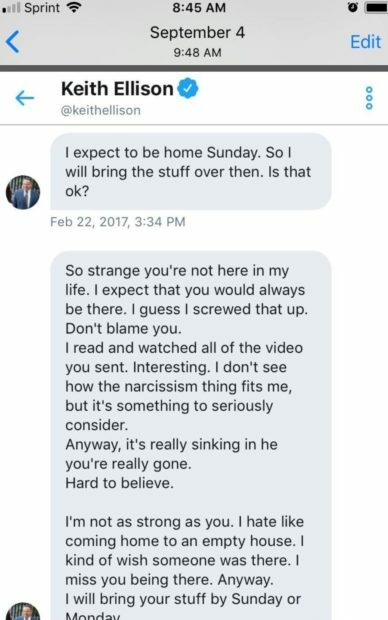 Another message from February 2017 expressed how much he missed Monahan and promised to “seriously consider” the “narcissism thing,” although Ellison still didn’t think it applied to him. “There are so many more of text like this,” wrote Monahan on another post. “Got in from NYC late. Got to leave tomorrow. I am really sorry,” wrote Ellison. “In this political environment, I don’t know what somebody might cook up,” Ellison said during the debate. “But I can tell you that there is absolutely nobody that I’m aware of … who’s threatening or suggesting or has ever made a prior accusation.